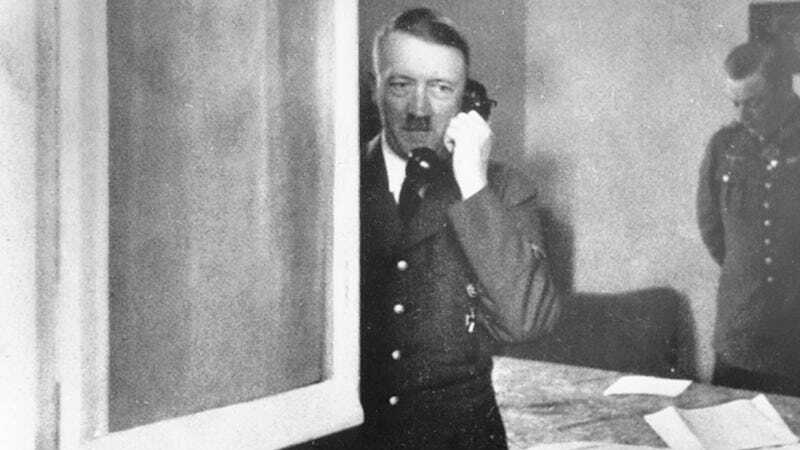 On Sunday afternoon, the telephone of Nazi Germany leader Adolf Hitler was purchased at auction for $ 243,000. It’s unclear why someone would covet an item once in intimate proximity to undiluted evil. Rich tapestries, I guess. ABC News reports that bidding began at $ 100,000. The purchase was made over the phone, according to Andreas Kornfeld of the Alexander Historical Auctions, but the buyer’s name has not been disclosed. The auction house maintains buyer confidentiality as a matter of protocol. Perhaps you’re wondering about the features offered by this instrument of villainy. The phone is red and sports the Nazi Party symbol. Hitler’s name is also engraved on the back. He purportedly used the phone in a number of locations: at his headquarters, but also in trains and other vehicles. When Russian officers—then occupying Germany—visited Hitler’s bunker in Berlin, they handed the phone over to British officer Sir Ralph Rayner. And now it belongs to someone else! Perhaps the buyer plans to burn it atop a pile of Mein Kampf paperbacks. A different buyer purchased Hitler’s porcelain Alsatian dog figurine for $ 24,300. Fun!